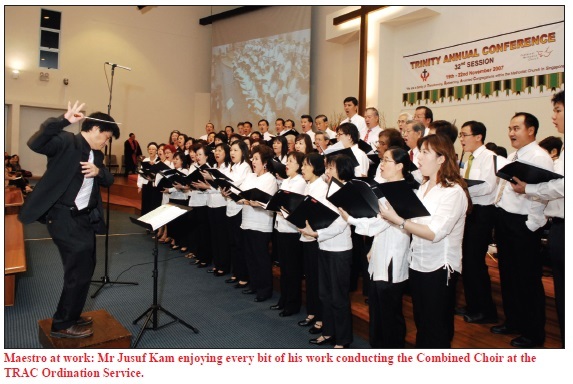 THE Methodist Church in Singapore reaped a bumper crop of eight new Deacons and six new Elders at this year’s 32nd Session of the three Annual Conferences. In addition, a Diaconal Minister, the Rev Jimmy Wong Phin Thau, was ordained during the Trinity Annual Conference (TRAC) Session, making him a historic first. 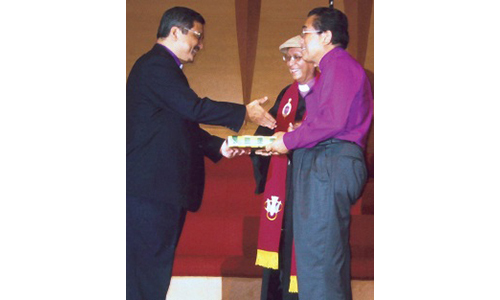 Two Deacons – the Rev Jasper Sim Sheng Chyi and the Rev Paul Thian Moon Hee – were ordained on the final day of the Chinese Annual Conference (CAC) Session on Nov 15, 2007 at Kum Yan Methodist Church. 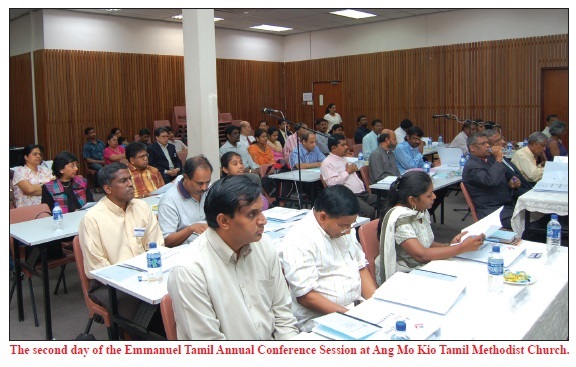 And on the final day of the TRAC Session on Nov 22 at Pentecost Methodist Church, six Deacons were ordained. 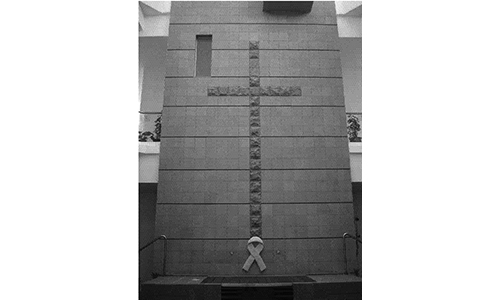 They are the Rev Bernard Chao Wee Chun, the Rev Khoo Kay Huat, the Rev Edmund Koh Leong Swee, the Rev Leslie Lim Kok Seng, the Rev Fred Tan Hee Kok and the Rev Aaron Tay Tian Yeow. 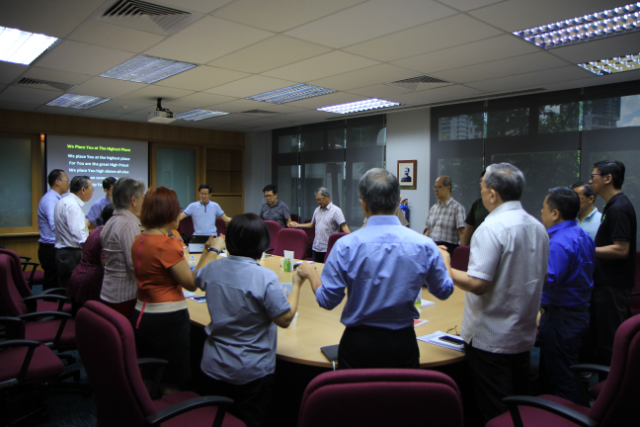 The CAC Session also saw the ordination of two Elders – the Rev Susan Lim Bee Yong and the Rev Herman Kan Man Shek. 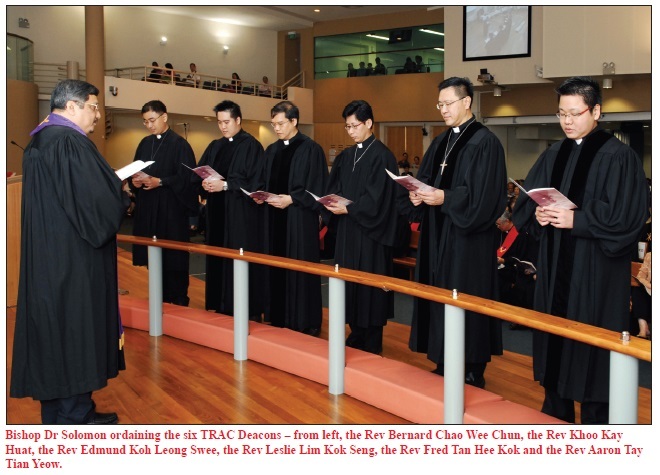 Four Elders were ordained at the TRAC Session – the Rev Lai Kai Ming, the Rev Daniel Cornilius Tran Boon Liat, the Rev Tay Kay Leong and the Rev Joel Yong Chi Wi. All the 15 ministers were ordained by Bishop Dr Robert Solomon.